Would You Like to Stop Sneezing This Allergy Season? After a cold and snowy winter, spring is a welcome change—except for seasonal allergy sufferers. Tree pollen is a major allergen that can cause sneezing, watery eyes, itching and a stuffy nose. According to research, when your nervous system is functioning properly, your immune system is going to perform much better. When we have an allergic response, it’s our immune system reacting to outward environmental stimuli. 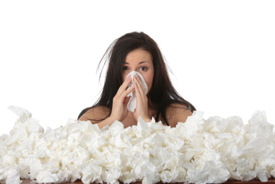 Those with a strong immune system can fight off the various allergens that are out there. So someone with a robust immune system still will be affected by the same allergens but not to the degree that a person with a weakness in their body would be when they are attacked. In today’s society, we’re taught that when we have allergies, the first thing we do is cover up the symptoms with medication or ointments. At Fresh Life Chiropractic, we want to identify and address the underlying cause, which is a weakness in the immune system and the nervous system. Through chiropractic adjustments, your body can better adapt to the environment. People’s inability to adapt to the changing environment is what causes them to react to different allergies, not just seasonal ones. Consider how widespread peanut allergies are. When I went to school no one no had peanut allergies, and a PBJ was a staple sandwich. So why are so many people sensitive to peanuts, which haven’t changed? What has changed is the body’s hypersensitivity to various stimuli. In many cases, people’s bodies never developed natural immunity. Instead, they’ve developed passive immunity—which we know is not as strong as having an active immunity. Getting sick is not a bad thing; it’s your body’s natural ability to fight it off. When we continue to not allow people to get sick, that’s when they develop hypersensitivities to something as small as grass or bee pollen. In my office young patients who had asthma or allergies are now free from them due to chiropractic. We didn’t add or take anything away from them but just corrected their spine. My kids don’t have allergies or asthma either, thanks to chiropractic care. We also recommend getting regular exercise, eating nutritious foods and avoiding sugar. This nutritionally bankrupt substance decreases immune strength and allows diseases to thrive.